In normal use, additional barcode labels are not necessary. But, you may find that you have older or special books in your collection that are lacking a unique barcode. 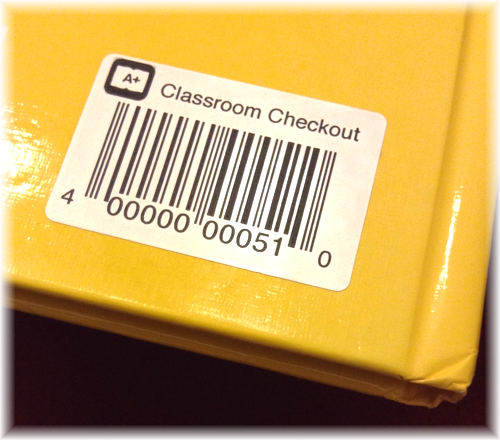 You can easily allow such books to work with Classroom Checkout by affixing a barcode label. Classroom Checkout will work with any EAN-13 labels. We make pre-printed labels available via mail order in the U.S. Note: When placing an order, please ensure that your shipping address includes an individual's name in the recipient line. These high-quality labels are specially designed for use in classroom environments: They're laser-printed and durable, constructed with a waterproof polyester material with a permanent adhesive. Each label is printed with a unique serial code, suitable for positively identifying a book in your collection. Need just a few labels? Download a free PDF with ten labels that you can print, cut, and tape! Copyright © 2014–2017 FikesFarm, LLC. All rights reserved.